€ 70.00 Registrations period has ended. € 55.00 Registrations period has ended. € 80.00 Registrations period has ended. € 25.00 Registrations period has ended. € 40.00 Registrations period has ended. “Galaxias”, the International Certified Lactation Consultants Association (IBCLC) of Greece and Cyprus, is organizing a two-day seminar on breastfeeding. This is Galaxias’ 10th annual seminar on breastfeeding, with the title "Approach with the eye of the experts". At the seminar the great international speakers Professor James McKenna and Catherine Watson Genna will share their knowledge with the participants. In the program will also feature IBCLCs from Greece presenting engaging topics concerning breastfeeding. Professor James McKenna, an anthropologist, specializes in infant sleep issues. He is the director of the Mother-Baby Behavioral Sleep Laboratory at Notre Dame University in Indiana, US. He has introduced the interesting term breastsleeping, and focuses on safe sleep practices while breastfeeding and bed-sharing. 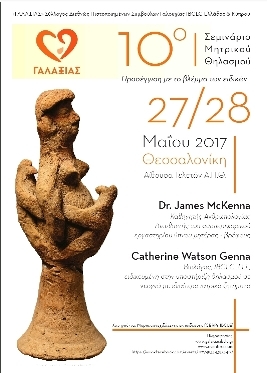 Catherine Watson Genna will be coming to Thessaloniki for the first time. She is a recognized speaker addresing health professionals for the care of newborns with neurological, anatomical or genetic problems. Her special interest is the study of the mobility of the tongue and the clinical assessment of short frenulum. She has a private IBCLC practice in New York and has significant experience in the management of complex cases.